Based on research on the development and education of young children, the standards were created with input from experts and educators from around the country. The standards define what NAEYC—the world’s largest organization of early childhood professionals—believes all early childhood programs should provide. Review this guide to help identify programs that meet NAEYC standards for high-quality programs. contribute as a responsible community member. Warm, sensitive, and responsive relationships help children feel secure. The safe and secure environments built by positive relationships help children thrive physically, benefit from learning experiences, and cooperate and get along with others. Children and adults feel welcome when they visit the program. 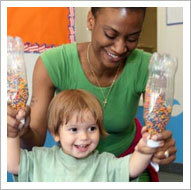 Teachers help new children adjust to the program environment and make friends with other children. Teaching staff engage in warm, friendly conversations with the children and encourage and recognize children’s work and accomplishments. Children are encouraged to play and work together. 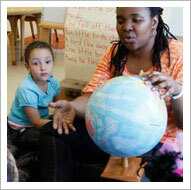 Teachers help children resolve conflicts by identifying feelings, describing problems, and trying alternative solutions. Teaching staff never physically punish children. A well-planned written curriculum provides a guide for teachers and administrators. It helps them work together and balance different activities and approaches to maximize children’s learning and development. The curriculum includes goals for the content that children are learning, planned activities linked to these goals, daily schedules and routines, and materials to be used. NAEYC and the NAEYC Accreditation system do not prescribe a specific curriculum; programs can design their own or choose a commercially available curriculum that meets NAEYC’s guidelines. 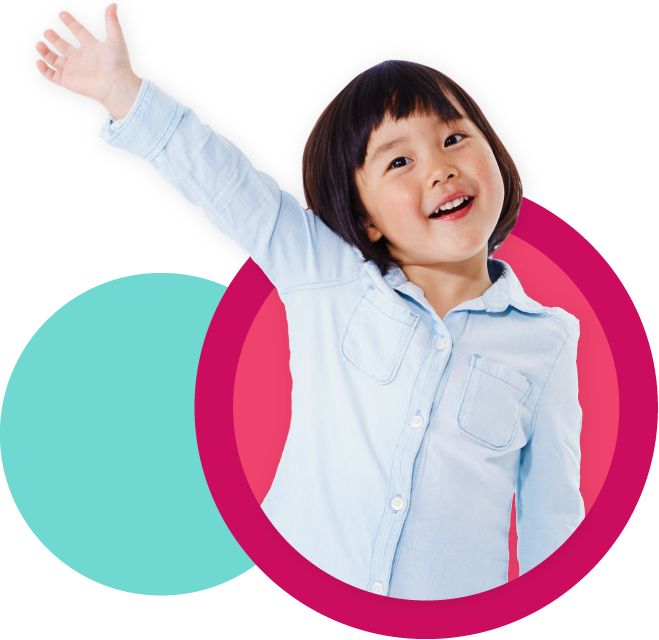 Ask about the program’s curriculum and how it addresses all aspects of child development. The curriculum should not focus on just one area of development. Children are given opportunities to learn and develop through exploration and play, and teachers have opportunities to work with individual children and small groups on specific skills. 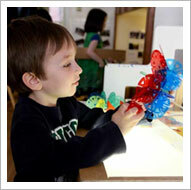 Materials and equipment spark children’s interest and encourage them to experiment and learn. Activities are designed to help children get better at reasoning, solving problems, getting along with others, using language, and developing other skills. 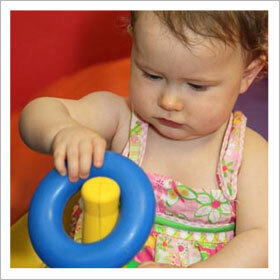 Infants and toddlers play with toys and art materials that “do something” based on children’s actions, such as jack-in-the-box, cups that fit inside one another, and playdough. The program uses developmentally, culturally, and linguistically appropriate and effective teaching approaches that enhance each child’s learning and development in the context of the curriculum goals. Children have different learning styles, needs, capacities, interests, and backgrounds. By recognizing these differences and using instructional approaches that are appropriate for each child, teachers and staff help all children learn. Teachers carefully supervise all children. Teachers provide time each day for indoor and outdoor activities (weather permitting) and organize time and space so that children have opportunities to work or play individually and in groups. Children’s recent work (for example, art and emergent writing) is displayed in the classroom to help children reflect on and extend their learning. Teachers modify strategies and materials to respond to the needs and interests of individual children, engaging each child and enhancing learning. The program employs and supports a teaching staff with the educational qualifications, knowledge, and professional commitment necessary to promote children’s learning and development and to support families’ diverse needs and interests. Teachers who have specific preparation, knowledge, and skills in child development and early childhood education are more likely to provide positive interactions, richer language experiences, and quality learning environments. Teaching staff have educational qualifications and specialized knowledge about young children and early childhood development. Ask, for example, how many teachers have Child Development Associate (CDA) credentials, associate’s degrees, or higher degrees. The program makes provisions for ongoing staff development, including orientations for new staff and opportunities for continuing education. 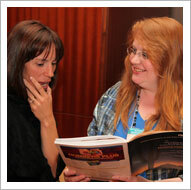 Teaching staff have training in the program’s curriculum and work as a teaching team. The program establishes relationships with and uses the resources of the children’s communities to support the achievement of program goals. Relationships with agencies and institutions in the community can help a program achieve its goals and connect families with resources that support children’s healthy development and learning. The program connects with and uses museums, parks, libraries, zoos, and other resources in the community. Representatives from community programs, such as musical performers and local artists, are invited to share their interests and talents with the children. The staff develop professional relationships with community agencies and organizations that further the program’s capacity to meet the needs and interests of children and families. The program has a safe and healthful environment that provides appropriate and well-maintained indoor and outdoor physical environments. The environment includes facilities, equipment, and materials to facilitate child and staff learning and development. An organized, properly equipped, and well-maintained program environment facilitates the learning, comfort, health, and safety of the children and adults who use the program. The facility is designed so that staff can supervise all children by sight and sound. The program has necessary furnishings, such as hand-washing sinks, child-size chairs and tables, and cots, cribs, beds, or sleeping pads. A variety of materials and equipment appropriate for children’s ages, skills and abilities is available and kept clean, safe, and in good repair. Outdoor play areas have fences or natural barriers that prevent access to streets and other hazards. First-aid kits, fire extinguishers, fire alarms, and other safety equipment are installed and available. — Kate in San Antonio, Texas. Her child attends an NAEYC-Accredited program. — Jen in Torrance, California. Her child attends an NAEYC-Accredited program. — Jennifer in Newark, New Jersey. Her child attends an NAEYC-Accredited program.